Any mission consists of two parts: the location at which the mission takes place and the actual mission itself. This seemingly obvious fact can cause some confusion because when you start the editor you must first open the location and then open or create the mission. Actually, in the editor's language locations are called projects and upon opening the editor a dialogue window suggests opening an existing project or creating a new one. Since the creation of a new map is beyond the scope of this instruction, choose the option «open project» or use one from the list of recently opened locations. The first mission will take place in the location «bulge» so for this lesson you should open the project with that name. 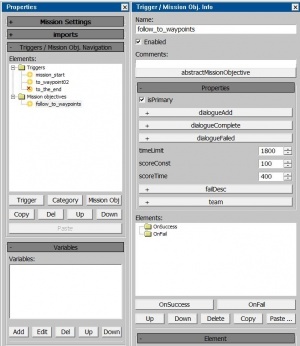 Our main tool for the job is the «Mission Editor» tab. If it does not open on its own, then open it yourself. As you can see, this tab has a large number of button options. Below you can see a table with descriptions of these buttons..
(Select). When you click this button, the editor switches to select object mode. You can also press the «Q» key on the keyboard to return to this mode when the location image window is active. (Move). When you click this button, the editor switches to moving mode. A three colored axis is drawn around the object, and the object can be moved along one of the axes by pulling on the arrows. You can also press the «W» key on the keyboard to return to this mode when the location image window is active. If you hold down the «Shift» key while moving the object, the editor will not move the object but will prompt you to create a copy of it under a new name. (Move over surface). When you click this button, the editor switches to move over surface location mode. The rest of this mode is identical to the simple movement mode. You can also use the keyboard shortcut «Ctrl+Alt+W» to return to this mode when the location image window is active. (Rotate). When you click this button, the editor switches to rotation mode. Three-colored circles appear around the object, and by pulling on them a player can rotate the object on one of three axes. You can also press the «E» key on the keyboard to return to this mode when the location image window is active. If you hold down the «Shift» key while moving the object, the editor will not rotate the object but will prompt you to create a copy of it under a new name. (Scale). When you click this button, the editor switches to scale mode. Three-colored axes and arrows appear around the object. Pulling on them allows you to re-size the object relative to the selected axis. You can also press the «R» key on the keyboard to return to this mode when the location image window is active. If you hold down the «Shift» key while moving the object, the editor will not change the object's size but will prompt you to create a copy of it under a new name. (Drop object). When you click this button, if the player has selected a particular object and the object is above the surface location level the object will be moved to the surface location – falling on it. This tool is useful for placing mission objects on the ground. You can also use the keyboard shortcut «Ctrl+Alt+D» to apply this tool to the selected object or objects when the location image window is active. (Select object by name). Clicking on this button will open a window with a list of all the mission objects where the objects can be selected for further manipulation. You can also press the «H» key on the keyboard to open the window with the list of objects when the location image window is active. (Show/Hide object props panel). Clicking on this button opens a window with the properties of the selected object (e.g. aircraft). You can also press the «P» key on the keyboard to open the window with the object's properties when the location image window is active. (Show units/areas names). Clicking on this button will display the objects' names in the main editor window. Clicking this button again will hide the objects' names. (Show all waypoints). Many mission objects can be assigned a path along which they must move. In order to see the path designated for the object it must be selected. You can click on this button, and the main editor window will display all the paths assigned to all objects. Clicking this button again will hide the path displays. (Show units icons). Clicking on this button allows you to enable or disable the display of icons over mission units (ships, planes, tanks, etc.). You should always keep this button enabled to facilitate work. (Show units assets).Clicking on this button allows you to enable or disable the display of the assets assigned to units for the mission. You should not keep this button enabled continuously since the display of large numbers of assets can lower the editor's performance. (Draw object Axis). Clicking on this button enables or disables the mapping of local coordinate axes for an object. Local coordinate axes appear as thin, three-colored lines originating from the center of the object. 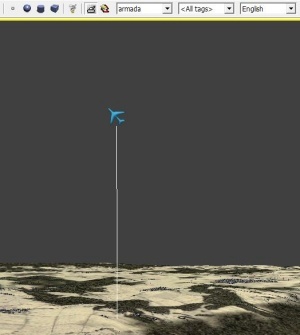 The direction of the axes can, for example, be used to determine where an aircraft flies after the start of the mission and to deploy it in the correct direction in advance. (Select only zones).Clicking this button will limit the ability to select objects to one specific type: zones. If you try to select an object that is not a zone, you will not be able to do so. Clicking the button again will turn off this mode. You can also use the keyboard shortcut «Ctrl+1» to return to this mode when the location image window is active. (Select only effects). Clicking this button will limit the ability to select objects to one specific type: effects. If you try to select an object that is not an effect, you will not be able to do so. Clicking the button again will turn off this mode. You can also use the keyboard shortcut «Ctrl+2» to return to this mode when the location image window is active. (Select only units). Clicking on this button will limit the ability to select objects to one specific type: units. If you try to select an object that is not a unit, you will not be able to do so. Clicking this button again will turn off this mode. You can also use the keyboard shortcut «Ctrl+3» to return to this mode when the location image window is active. (Select only waypoints). Clicking on this button will limit the ability to select objects to one specific type: waypoints. 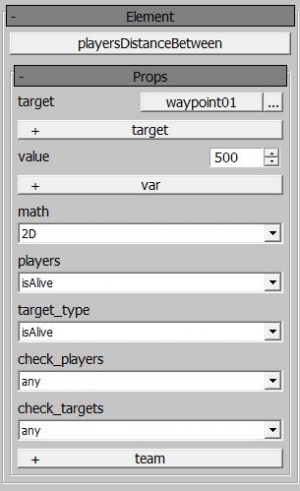 If you try to select an object that is not a waypoint, you will not be able to do so. Clicking this button again will turn off this mode. You can also use the keyboard shortcut «Ctrl+4» to return to this mode when the location image window is active. (Create point zone). Clicking this button turns on the mode to set up a new point zone. In order to set up a zone, click the mouse cursor on a surface location in the main editor window. New zones will continue to be set up every time you click until you manually disable this mode. Point zones are convenient to use for notation of waypoints along which the player will have to fly. (Create sphere zone). Clicking this button turns on the mode to set up a new sphere zone. In order to set up a zone, click the mouse cursor on a surface location in the main editor window and hold the mouse button down while dragging the cursor to the side to adjust the radius of the sphere. New zones will continue to be set up every time you click until you manually disable this mode. Spherical zones are convenient to use for notation of specific areas in the airspace or any logical structures used by the mission logic. (Create cylinder zone). Clicking this button turns on the mode to set up a new cylindrical zone. In order to set up a zone, click the mouse cursor on a surface location in the main editor window, hold the mouse button down while dragging the cursor to the side to adjust the radius of the cylinder, then release the mouse button and slide the cursor up to set the height of the cylinder. Click the mouse button again to complete the creation of the cylinder. New zones will continue to be set up every time you click until you manually disable this mode. (Create box zone). Clicking this button turns on the mode to set up a new box zone. In order to set up a zone, click the mouse cursor on a surface location in the main editor window, hold the mouse button down while dragging the cursor to the side to adjust the length of the zone, release the mouse button and slide the cursor to the side to set the width of the zone, click the mouse button and hold it while sliding the cursor up to set the height of the zone. Release the mouse button to complete the creation of the box. New zones will continue to be set up every time you click until you manually disable this mode. (Create effect). Clicking this button turns on the mode to set up a new effect. In order to set up an effect, click the mouse cursor on a surface location in the main editor window and hold down the mouse button while dragging the cursor to the side to adjust the radius of the effect's sphere. New effects will continue to be set up every time you click until you manually disable this mode. (Create unit). Clicking this button turns on the mode to set up a new unit. In order to set up a unit, click the mouse cursor on a surface location in the main editor window. New units will continue to be set up every time you click until you manually disable this mode. The type of unit created depends on which one is selected in the adjacent field described below. (Create waypoint). Clicking the button turns on the mode to set up a new waypoint. In order to set up a waypoint, click the mouse cursor on a surface location in the main editor window. New way points will continue to be set up every time you click until you manually disable this mode. To assign a waypoint to a specific unit, you must select the unit before setting up the waypoint. :structures – all sorts of structures :infantry – people :tracked_vehicles – tracked vehicles :ships – ships and boats :radars – radars :air_defence – anti-aircraft weapons :wheeled_vehicles – wheeled vehicles. :squad – logical structure which allows you to combine several (up to 16) units in the same group. (New mission). Click this button to create a new mission. (Save mission). Click this button to open a dialogue box to save a file whether the mission is being saved for the first time or if it has already been saved. You can also use the keyboard shortcut «Ctrl+M» to save a mission. (Save mission as..). Clicking this button opens a dialogue box to save the file and prompts a request to enter a new name for the file. (Run mission). Click this button to minimize the editor (but not close it) and start the game with the mission opening automatically at the start. Open the Bulge location in the editor and wait for it to finish loading. Most likely, you will find that the camera is looking at the terrain below and not with the most ideal viewing angle. In order to be able to «fly» the camera over the terrain, zoom in and out, turn the camera, and do other things it is necessary to activate free camera mode. To do this, click the mouse cursor within the main editor window and press «Space». Immediately after pressing the space bar, you will see that the mouse cursor has disappeared. Congratulations, you have activated free camera mode! Now, you can change the camera angle by moving the mouse, the «WASD» keys make the camera move in the desired direction, and holding the «Shift» key on the keyboard makes the camera respond to all these actions noticeably quicker. 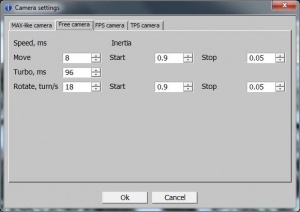 If the camera's movements still seem too slow, in the main menu of the editor select: «Settings->Cameras» to get into camera settings. In the window that appears, navigate to the tab «Free Camera» and change the «Move» and «Turbo, ms» settings which are responsible for the camera's movement when pressing «WASD» and «WASD» while holding the «Shift» key respectively. When you have finished changing the settings, close the window and check the movement speed. If you are still not satisfied with something – edit the camera settings again. .
By default the editor window displays the terrain model and height map. Under normal circumstances, information about the height map is not needed when creating a new mission and can be disabled. To do this, click the mouse within the main editor window and press the «F11» key. You will see a window appear with editor plug-ins. Find the row «(filter) HeightMap» and uncheck the box next to it. This will disable the display of the height map leaving the terrain itself with all its textures. 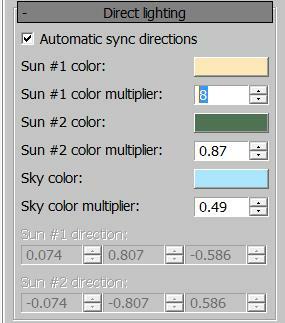 If the lighting brightness of a location seems too high or low, you can change its brightness. To do this, look closely at the toolbar. As you can see, it consists of several tabs. Right now, the «Mission Editor» tab is active. Switch to the «Environment» tab by clicking on it. The toolbar will change, but most importantly, a window will open with lighting settings. In the window, find the setting «Sun #1 color multiplier» and adjust its value. Note, as you are adjusting the values for this field, the changing lighting of the landscape. Select the value you are satisfied with and return to the «Mission Editor» tab.. If you have carefully read the list of available commands, you have probably guessed what you are going to do. Select the option «armada» in the field «Choose type of unit created», use the «Create unit» button, and place the player's aircraft anywhere on the map. On the main screen the green icon for an aircraft should appear with the name «armada_01». We exit the mode for creating new units, select the aircraft, and click the button “Show object properties panel” in order to open the window in which we can edit the properties of our unit. In the window that appears, at the very top, we see the field «Name:» with the value «armada_01». Let's enter the name «player» instead so we can immediately tell that this is the player's aircraft. Under this field is the «Type» field in which you can change the type of unit if you want, but we won't do that. Further down are three fields titled «Position». In the first field is the object's coordinate along the X axis, in the second – the Y axis (height above the surface), and in the third – the Z axis. All coordinates are calculated from the origin coordinate of the loaded location. Set the height of the aircraft to 500 meters to be in close proximity to the surface. Make sure that the resulting change in the height of the aircraft does not place it below surface level if, for example, you originally placed it above a tall hill. Most likely, after you changed the height of the aircraft it disappeared from your screen. But that doesn't matter. We click on the button «Select object by name». In the window that appears we choose «player», click «Ok» to close this window, and press the «Z» key which moves the editor's camera to the currently selected object. Look, we have found the missing plane. We select the aircraft again and open the window of its properties. Below the «Position» field is the field «Class» which itself consists of two fields: from «Class», we can specify the type of aircraft in which the player will fly the mission and its armaments. Select the «Yak-9t» aircraft and assign it «Yak9_default» armaments. Below some other fields is the section «Properties». The title of this section is in a gray box which means that the section can be expanded and collapsed. Try to collapse and expand this section. As you can see, in its expanded state this section does not fit within the screen and some of its fields are not visible. To access these fields simply roll the mouse wheel and note how the object properties window scrolls. At the very top of the «Properties» section is the field «army». This field indicates to which side the object will belong. Hopefully, the player and allied troops were in the army with the index «1», and their opponents in the army with the index «2». Change the player's army index to «1» right now. Below this field is another section that can collapse and expand under the name «plane». This section is responsible for the formation in which the units will move. Leave all the fields unchanged – you can play with them later on your own. Collapse the section and note the field below it. This field is called «count» and determines how many units will be in the squadron. Currently, the field has the value «1» which means that if we start a mission we will be in the air alone without another soul around us. But if we change the value to «2» then we will have a partner who will fly the same course as us. Let's change the value to «4», bringing the number of aircraft flying to four. As you probably know, pilots do not fly alone or in small clumps but fight in pairs or – rarely – groups of three. Even if a large group of aircraft are flying together, within the formation they are still broken down by leader and wingman or wingmen. The wingman's job is to protect his leader. To break down our 4 aircraft into 2 such pairs, it is necessary to click on the «+ numInWing» button directly under the field «count». Clicking this opens the «numInWing» setting whose value we can now change. Set this value to «2». So we have put the aircraft on the map, set its height, assigned the aircraft's type, indicated the quantity of aircraft, and divided the aircraft into pairs. Once again, select the player's aircraft or just look at it if it is already selected. You can see three lines – red, green, and blue – coming out of the plane. The red line shows the direction in which the player's aircraft and the planes following it are flying at the start of the mission. Using the «Rotate object» button, turn the aircraft so that the red line is facing the desired direction. Try to save the mission. When you try to save, the editor displays an error. In the top row of buttons in the editor window is a button to open the console (Show/hide console). Clicking on it will open the console window in which our error message will be written in red: «[MissionSettings] Target [unit] not found!». The first point of the error «[MissionSettings]» indicates where the error occurred – in the mission settings. Despite the fact that the error in this case is uninformative, usually there is an indication of the specific place at which the error occurred. In the meantime, we have to believe that the error occurred because the game cannot understand where the player is. To correct this error we have to learn how to create a player. We need to define which aircraft in the game is the player's To do this, click the button «Mission properties». Then opens a window consisting of several fields and sections which you can collapse and expand. Expand the section «Mission settings» and inside it find another section «player_teamA». Expand it if it is collapsed. In the «wing» field of this section click the button «<none>» and in the window that appears select «player». That's it. You just indicated to the game which aircraft should be considered the player's aircraft. Save the mission and run it for verification. It is time to do our first mission. Let's make it a simple mission in which we will just have to fly over a certain route. A training example of such a mission is «sample01_bulge_simple». You should already have the «Bulge» location open with the player's aircraft displayed. Let's continue to develop this mission. Before we start to arrange the aircraft, we need to specify the basic properties of the mission. In the «name» field enter the name of the mission in English. This name must be unique to the entire game and is the identifier of the mission. There should not be any other missions with the same name. In the «level» field choose the map that the game will load when the mission is selected. In our example, this should be the «Bulge» map. Select the type of mission (in your case it is singleMission). In the list restoreType, set attempts if you want the player to have several attempts to complete the mission (after the player crashes, he will respawn at some point not far from the crash site), or tacticalControl to allow the player, in case of a crash, to take the aircraft of one of his teammates provided of course that they are still alive. In the list «campaign» you should select «western» so that the mission takes place on the western front. This choice is dependent on which section of a single mission your mission will be played in. In the «environment» field select the type of sky for the mission. In the «weather» field select the type of weather you like best. After fixing these settings, you can collapse the entire list of «Mission Settings». Let's outline the route by which the player will have to fly. To do this, use the button «Create point zone» to set two points – trying to make sure they are on roads. Change the name of the points to «waypoint01» and «waypoint02», and raise them to a height of 1000 above the surface of the terrain. Save the mission. In order to show the player where to fly, you need to somehow indicate the point of the route he needs to reach. To do this, in the section «Triggers / Mission Ob. Navigation» click the button «Trigger» to create a trigger. The mission's entire logic will be precisely defined by the triggers. Select the newly created trigger in the window to the right and change its «Name:» to «start_mission». Under the name of the trigger you can see the field «Enabled» with a check-mark. This means that the trigger will be activated immediately after the start of the mission. Below in the same window you can see the field «Elements» in which there are three empty trees: «Events», responsible for when the execution of the trigger is attempted, «Conditions», responsible for which conditions exist to verify the trigger's execution; and «Actions», responsible for what happens in the trigger. In the «target» field select the first waypoint through which the player must pass «waypoint01». Check the box across from the «visible» field to display the point in the game space and on the map. Check the box across from the «primary» field to further mark the point as a primary waypoint for the player. Save the mission, run it, and verify that everything works as needed. In the «target» field, specify the the distance to which the point must be approached, for example «500» meters. In the «match» field leave «2d» so that the verification will not take vertical distance into account. Leave the other fields as they are. They will be addressed further in other examples. Create another trigger named «to_the_end» and uncheck the «Enabled» field located right below the name of the trigger. This will prevent the trigger from becoming active immediately when the mission starts. .
Now, let's turn on this trigger after the first waypoint is reached. To do this, add a new command to the trigger «to_waypoint02»: «triggerEnable» and for the «target» value select «to_the_end». This will make the triggers occur sequentially. 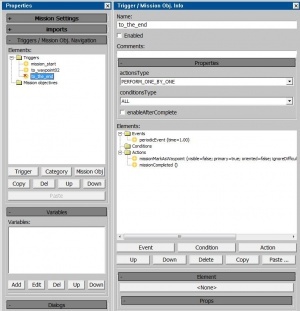 In this example, it is not necessary to disable a trigger once it has finished because the triggers are in a strict sequence, and, after executing all their internal commands, they turn themselves off. To the «to_the_end» trigger add the command «missionMarkAsWaypoint» in which you turned off the display for our last waypoint. Then add the command «missionCompleted». Save the mission and run it to make sure that everything works correctly. All our missions will have one quest: «fly the route» To add this, you need to create a text document with the same name as the file in which you saved the mission but with the extension «.csv» Open this file in a text editor and save it in «UTF-8» coding. Now add this line to the file: «"follow_to_waypoints";"Follow to checkpoints";" Follow to checkpoints"» and save it one more time. The line you added consists of three parts enclosed in quotation marks and separated by semicolons. The first part «“follow_to_waypoints”» is the unique quest identifier. A single file should not have another identifier with the same name. The second part «“Follow to checkpoints”» is the quest text in English. 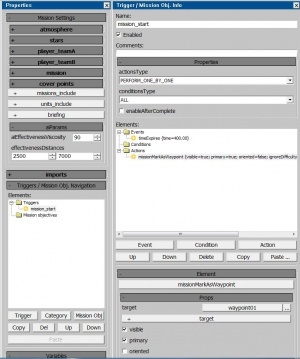 Now return to the game editor, open the mission properties window, and find the section «Triggers/Mission Ob. Navigation». At the bottom of this section you will see a row of buttons. 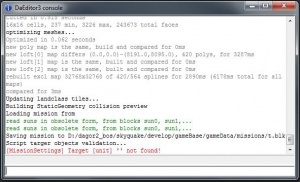 Click on «Mission Obj» and select «abstractionMissionObjective» in the window that appears. You will create a new mission objective. Select the newly created mission objective, and in the window to the right change its name to the identifier from the text file without quotation marks: «follow_to_waypoints». Save the mission and start it. Make sure that when the mission starts you receive the mission quest. Also add the command «wait» changing the «time» value to «3» seconds. This is to ensure that some time passes between the quest completed message and the subsequent mission ending message so that they are not overlapping each other. Move this command so that it is between «moSetObjectiveStatus» and «missionCompleted»..
Congratulations, you have finished your first mission. Save and run it for verification.